For all size shops from start-up to full production operations, this low cost, self-contained exposure unit with long lasting LED lights is ideal. It creates an efficient and evenly distributed actinic light profile. Screens exposed on the Pro-Light LED hold excellent details and fine lines for sharp, clear images with emulsions or films. 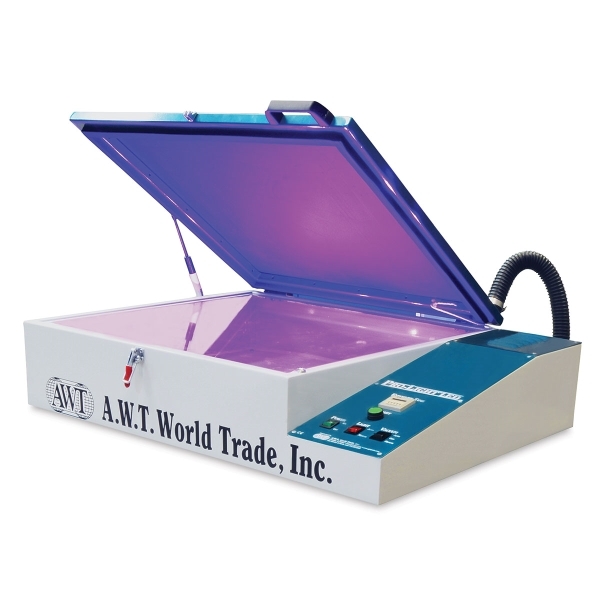 The non-porous, flexible rubber blanket, quiet vacuum motor, and photo-clear glass combine to produce accurate copy transmittal and minimize undercutting. Pro-Light LED has easy-to-use controls, including a 15-minute digital timer that shuts off automatically. Instructions for set-up and maintenance are included. 115 V.
Optional Legs and Shelf — Attaches underneath the unit. Optional shelf attaches to the legs.